Like most people, I have several regrets in life. The first one that comes to mind happened in 1977. The Dalai Lama came to my hometown and made an appearance at a local United Church. My social studies teacher had asked us to attend. It was on a Sunday night. Another regret that I have is that I didn’t pay more attention in English class. As it turns out, decades later I have developed a penchant for writing. Not that I ever aspired to be a writer mind you, it’s just the unfortunate result of an ever present inner dialogue going on inside my head. However, as soon as I try to set my mind to paper, my punctuation and grammatical skills tend to be quite elusive. I can’t tell my dangling participles from my modifiers. And the third regret that I will share with you also involves education. In high school I had thought that Latin class would be easy credit. Well, it was not so easy but I did get the credit. I never really immerse myself because I thought I’d never need it. Looking back, and knowing what I know now, I wish I had devoted more time and effort into that subject. Allow me to tell you about a wonderful documentary series I came across a little over a year ago. The show was called “Meet The Romans,” and it was hosted by Mary Beard, professor of classics at Cambridge University. 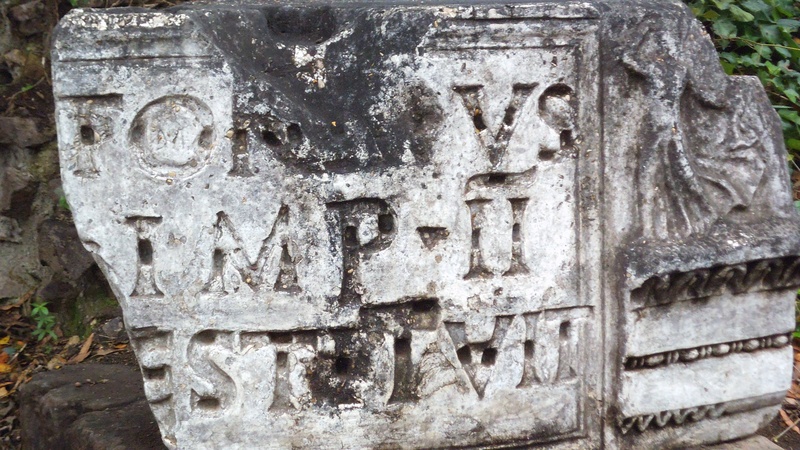 In this series, Mary Beard educates us on all the epitaphs found in and around Rome. And what is so special about all these epitaphs? Mary tells us they are ancient voices from the humanity that occupied Rome. I am not one to be easily engaged in discussions over war and strategy but rather how life must’ve been way back when. However, should you ever want to compare notes on the lifestyles of the rich, poor and ancient, I will happily oblige. Insight. I’m always looking for more and more insight. And these epitaphs have it all. This is quite unlike the headstones in today’s cemeteries which would give only the name, the date of birth, date of death and perhaps a quote. Maybe even a picture. I am utterly amazed at the way Mary Beard can take an ancient stone and transform it into the life history of a person who lived 2000 years ago. From a simple epitaph she can ascertain lifespan, the occupation, cause of death, age, if they had a partner, or any ailments they might have had. All that from a headstone etched in Latin. Now, I am not a teacher or archeologist. However, I do sort mail for for a living, which from time to time allows me to glean some insight here and there. Recently, I came across a magazine published for funeral homes. What caught my attention on the front page is a revolutionary new idea. What is available now to those who of course are willing to pay for it, is a headstone that includes an embedded barcode of sorts. When scanned with a handheld device like an iPhone or an iPad it will automatically provide information on who the deceased was and any other information that their family has allowed to be made available to the general public.